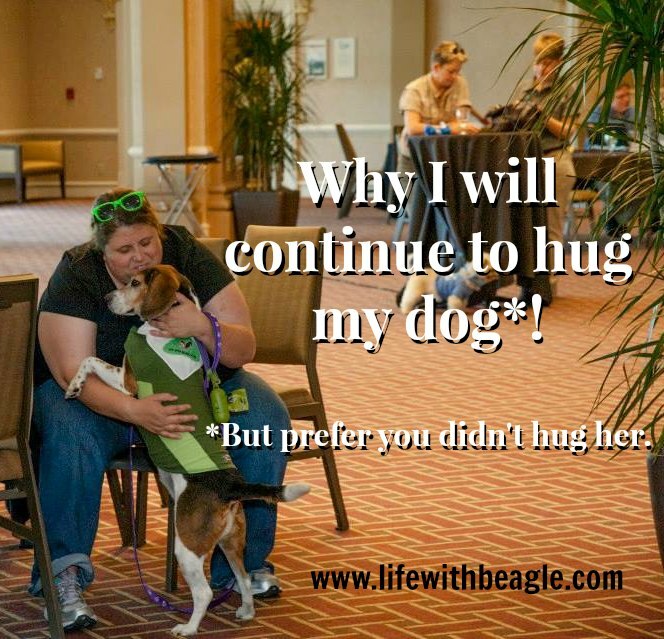 That horrible picture of me was taken last year at the BlogPaws Conference in Nashville. It's also the only photographic evidence I have that Lulu and I hug each other. Not all the time, mind you. When she wants to. I realized Lulu enjoyed hugging about a year after I got her. It was my first overnight trip away leaving her behind. She was so excited to see me, she jumped into my lap and pressed herself against me. I put my arms around Lulu and hugged her. Since then, if I say to Lulu "can I have a hug?" she will put her head on my chest and I will put my arms around her. But if Lulu doesn't WANT to give me a hug, I don't force her too. 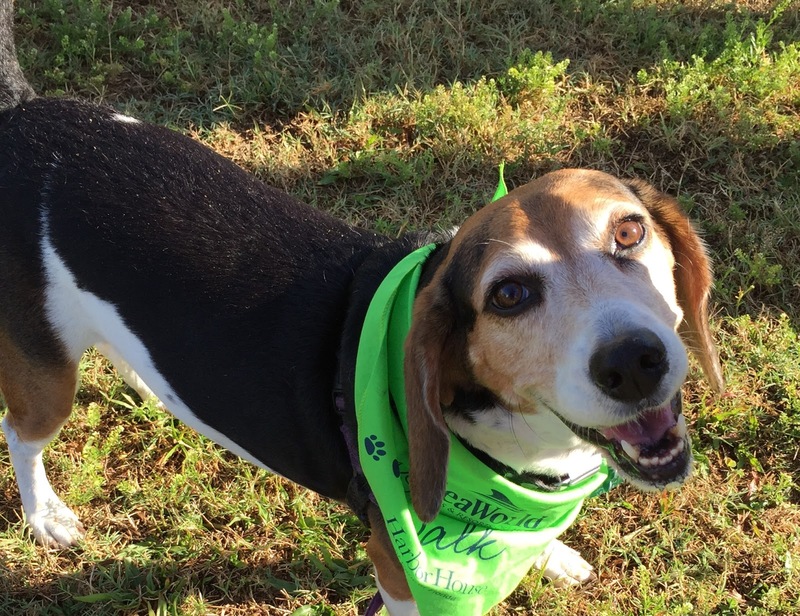 Just because a dog is happy and a people person doesn't mean they want to hug. Dogs don't like to be hugged? Here's what is causing online media to freak out over hugging dogs. 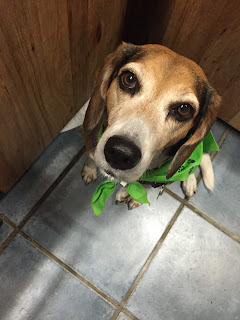 Dr. Stanley Coren, a psychologist who has written several books on dog behavior and is considered an expert, wrote this piece in Psychology Today. He said he checked out some 250 pictures of dogs and people hugging, scrutinized the dogs' mannerisms in the photos, and say it proves dogs are not happy when they are hugged. Coren's point is dogs are not humans, and while hugging has been shown to be great for humans, especially in terms of parent-child bonding, hugging a dog immobilizes them and can increase their stress level and actually may lead to the dog lashing out (i,e. by biting). I am not going to dispute that a hugging is not a behavior dogs universally love or that it might cause stress or even aggression. I am not an animal behaviorist, and far be it for me to question someone as respected as Dr. Stanley Coren. But generalizations help no one and this is a generalization I disagree with. I have a former co-worker with this amazing dog who hugs people. It's what he does. He gives complete strangers hugs. It's like he feels they need them. Where does he fit into Coren's equation? What is missing from Coren's essay, in my uneducated opinion, like in those pictures he used to make his point, is context. A picture is one moment in time. We can't completely judge a situation simply from a picture. We don't know what happened before or after a picture is taken. And have you tried to take pics of dogs? They don't always like to sit still! What is the context of a hug? Who is doing the hugging? Is it someone the dog knows? Is it someone the dog trusts? Is it someone the dog loves? Is the dog taken off guard by the hug? Did the person force themselves onto the dog? But you know what? These questions should be asked in ANY case when a dog displays signs of stress or even aggression toward a person. I told you Lulu will hug. But she's not a hugger. She's not a cuddler. She doesn't seek my attention the way Jasmine does. And if I get cuddles from Lulu, it lasts maybe 10, 15 minutes, and then she's off on her side of the bed or off the couch and sitting on the recliner. Sometimes I'm disappointed by this, but generally I'm OK with it because most people who are close to me will tell you I'm not really a touchy-feely person either. Not all humans want hugs all the time either! Generally, Lulu wants my attention when food is present. Marc Bekoff wrote a response in Psychology Today. Here were his counter-points. Pay close attention to the dog. Dogs are sending out signals all the time. They will tell you if they want that kind of close connection at that moment. Not all dogs are unconditional lovers. Lulu is OK with my hugs, and she is generally friendly to everyone. Jasmine begs for my attention, but is generally suspicious of people, especially those she doesn't know. Not all dogs are the same. Just because you had a beagle growing up that was a snuggler doesn't mean my beagle will immediately want to snuggle you. 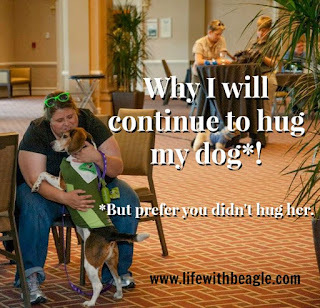 Don't assume Lulu or any other beagle will automatically react the same way. When in doubt, don't hug! And I would add to this one thing I do agree with from Dr. Coren: kids. Don't let kids hug dogs unless that kid and that dog are really well bonded. It is a recipe for trouble. So yes. I will continue to hug my dog when my dog allows it. And I encourage you to hug your dog if you can do so as well. Because we know our dogs. And we understand our relationship with them. Just don't go hugging someone else's dog. At least without that dog's permission. Are you a dog hugger? What do you think about Dr. Coren's study? Tell us below! I remember something about you shouldn't hug your dog thing wrote and I thought that was hogwash. I love to give hugs and I also love when I get hugs. I am a hugger. I get hugs daily. I demand hugs daily. I am glad you wrote about how lulu likes hugs. Carma the next time I see you, I'm giving you a hug! Great post, and I really was surprised how much Coren's "study" took off this week. I don't mind if it raises awareness of dog body language, but it's far from any sort of conclusive research. Like you say it's important to remember that dogs are individuals, and for many a hug from their owner is a lot different than from a stranger. Thanks Jen. I had seen some stuff off and on, and I figure it must be a slow pet news month or something. So I guess, when it blew up online it didn't surprise me. But I just felt the need to say something because I thought his "proof" was a little ridiculous. He's mostly likely right, and I agree it's good it raises awareness. But it was a bit nonsense to me. I am certain Leo does not like being hugged as much as I like hugging him. But he lets me do it, and for that, I love him. They are very forgiving to those they love. I'm paying that "news" no attention either. Gretel likes to hug me. She asks for it and I give her the attention in the way that she wants. Now, there are times when I initiate hugging her. Some of that time it's clear that she's really just not that into me. Ha, ha. I just do it anyway? I don't think there is a reason to freak out because she shows a little uncertainty. She trusts me and it doesn't traumatize her. I would never let a stranger, or someone she clearly didn't like, do that to my dog though. I'd be totally ok if he had been more moderating about it. I think the real problem is he said no hugging whatsoever, and that just doesn't make sense to me. People who should get his message are just blowing him off now.